INTERAERIAL SOLUTIONS – the largest trade fair and communications platform for the manufacturers, service providers and users of drones in Germany – is drawing experts from industry, market research, law and science to a round table discussion to highlight the hottest topics in unmanned aerial systems (UAS). For starters, it’s most likely just a matter of time until UAVs are swarming through the air along flight corridors. An overview of recent and future developments in unmanned aircraft (See all the interviews of the round table discussion here on Intergeo TV on our subchannel “Drones”). The three traffic channels of road, waterway and airspace for piloted aircraft can expect a new addition. Experts view flight corridors for unmanned aerial systems as the most likely new channel for managing the expected increase in unmanned air traffic. This will see UAVs sharing a band of airspace several hundred metres above our heads. The German Federal Ministry of Transport and Infrastructure (BMVI), which is responsible for air traffic law, is currently working on a uniform pan-German regulation for flight permits for unmanned aerial systems (UAS), or drones. Harry Denz from Hamburg’s Authority for Industry, Traffic and Innovation hardly expects “droneways” to be named as the fourth traffic channel in legislation due next spring or summer. But he does believe the BMVI will adapt current laws to reflect new realities. Legislators are likely to introduce compulsory identification and registration measures for UAVs according to their weight and intended use and a licensing system for pilots. Denz does not believe Berlin will go as far as the U.S. by making UAV pilots’ licences subject to training. All the same, licensing is likely to depend on knowledge of air traffic law, meteorology, skills and above all experience in flying the machines. The revisions to flight legislation so keenly awaited by industry are a reaction to this mushrooming sector. Kai Wackwitz from specialist UAV market research company Droneii.com says: “The market is growing like crazy.” And it’s mainly two fields that are propelling drones with such force – surveying all kinds of buildings and constructions and inspecting industrial plants and infrastructure. In the professional sphere, it is geo applications that have formed the driving force behind the UAV industry, more than aerial photography or real estate uses. Although photos and films taken from a bird’s-eye perspective and promotional videos of property for sale have their uses on the market, they form nowhere near the most pressing demand. Matthias Beldzik from Ascending Technologies describes why UAVs are successfully breaking into surveying and replacing conventional methods. This drone manufacturer and UAV services supplier helps energy companies inspect oil platforms, for example. It had previously taken the customer precisely 728 days to inspect offshore systems using conventional methods requiring a great deal of human resources and time at considerable cost. Using multicopter systems for these inspection tasks has slashed the time to just 14 days. That’s two weeks instead of two years! The comparison speaks for itself. Bridge inspections, quantity calculations and checks, construction progress checks and optimisation, site exploration for wind turbines and solar farms – these tasks all form part of the current portfolio of regular work for the booming UAV sector. And there’s plenty more potential in the pipeline, should the legal framework be brought up to date with the latest technology and economic prospects. Legislators need to ensure safety at the same time as stimulating economic activity. The former applies to both humans and vital safety systems such as refineries, airports and power plants. Three methods have emerged for protecting buildings. One way is to seal off sensitive installations so that UAVs can’t take off or fly in the vicinity. The second is to automatically prevent drones from exceeding a certain distance from the pilot on the ground. And the third possibility is to monitor the “automatic dependent surveillance – broadcast” (ADS–B) sensors for the UAV’s movements in air space in the same way as with manned aircraft. Regulations that allow UAVs to fly out-of-sight and fully independently will boost the market considerably. Although we’re still some way off fully autonomous UAVs that react to unexpected obstacles in real time with the aid of intelligent sensors and an on-board “vision kit”, researchers are working on this at full speed. Photogrammetry is experiencing a true “second wind” thanks to drone technology, according to Professor Thomas P. Kersten from HafenCity University in Hamburg, as the art of surveying and gathering information in images enters a new pioneering development phase using “flying tripods”. The current boom in photogrammetry kicked off when drones bridged the gap between ground and aerial imagery and research reaped results in computer-based representation. Scientists were now able to create photo-realistic, explorable virtual-reality 3D images pixel-by-pixel from pictures, e.g. of Rome (University of Washington’s “Building Rome in a Day”) or recreate entire cities, as in the Photo Tourism project (run by the University of Washington using Microsoft technology). Kersten sees a blossoming future in combining the algorithms in computer-based representations with the precision of photogrammetry and the new flight systems. After all, the end results are getting more and more accurate and the cameras increasingly sharp and stable – which in turn further expands the range of applications. Industry, science and politics are working hand in hand on fine-tuning the future of unmanned aircraft systems. Market researchers are finding it difficult to forecast sales in this dynamic sector – after all, nobody really knows precisely where UAVs will lead. Although the chances of drones delivering pizzas to our front doors still seem slim for the next ten to twenty years, Hamburg-based aviation expert Denz can certainly conceive the possibility of deliveries to collection points. Experts are already working flat-out on experiments. 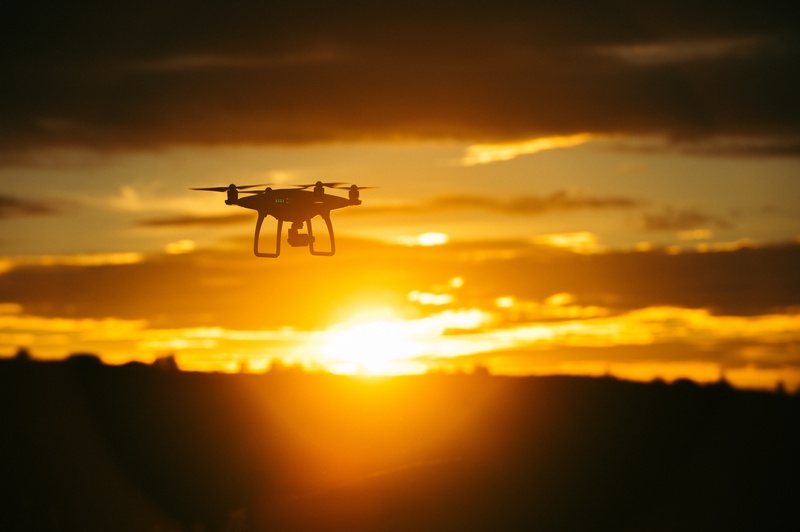 While in Germany the focus is mainly on supplying sparsely populated regions, drones are already delivering medicines to remote outposts in the African Republic of Mali.